When we think of tete-a-tetes, we usually think of Victorian times, but there are many more modern versions as well. Tete-a-tete literally means head to head in French, and it is a two-seat sofa, basically consisting of two chairs joined together. Its primary use was for private conversations as its other names suggest. The tete-a-tete is also known as a courting chair or a gossip couch. It was developed during the early 19th century in France and was popularized during the Victorian era. The Victorian ideals of modesty and controlled courtship are illustrated by the shared armrest which provided a slight barrier between the couple sitting on the sofa! One of the most famous examples of a tete-a-tete is this one which was made by John Belter, an American cabinetmaker, around 1850-1860. His extravagant use of carved ornamentation is typical of Rococo Revival style. It is displayed in the Metropolitan Museum of Art in New York City. 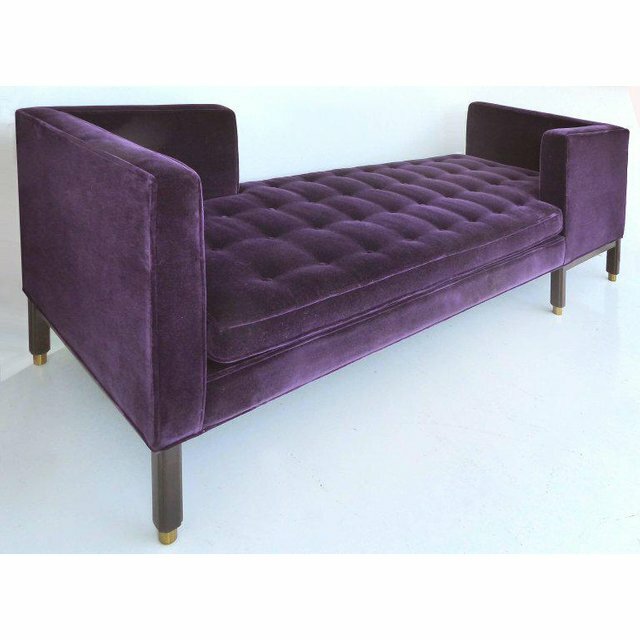 In many mid-century modern versions of the tete-a-tete, the shared armrest for modesty is gone – in fact this Edward Wormley tete-a-tete from 1950 looks more like modern double chaises we see today. We saw this one for sale on www.decaso.com for $15,000. We thought this ultra-contemporary tete-a-tete that we saw on Houzz is a very unique and dynamic art piece, but we could not find any information about where it could be purchased. The rattan Confident armchair from Maison Drucker that we saw in Elle Décor comes in a range of colorful options as a part of its outdoor bistro seating collection. It is priced at $3912. For some, two heads may be better than one! Over the years, design trends have waxed and waned and there have been many times when minimalism was popular as well as times when maximalism was in vogue. Today, we have been seeing both styles in shelter magazines. There are often spreads on beautiful and sleek contemporary spaces as well as wonderful “over the top” maximalist rooms. “Less is more” is absolutely the way to go for some while others follow architect Robert Venturi’s credo that “less is a bore.” We say to each his own. Minimalism highlights the essence of a room, stressing clean lines, clutter-free spaces, and a limited color palette. Designing a beautiful, functional home in a minimal way is not easy. Skill, restraint, and a great deal of discipline are needed to pull it off. We love this living room by Tara Benet Design in New York City. Maximalism is the antithesis of minimalism with its audacious display of bright colors, bold patterns, and a love of artful clutter. Maximalist spaces reflect their occupants’ travels, pasts, and quirks. 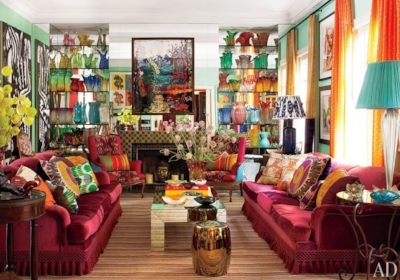 Exotic Bohemian glamour comes to mind when thinking about maximalist design - rather than trying to achieve a perfectly coordinated space, maximalists strive for a layered look to embrace a beautiful, cozy chaos as can be seen in this photo from Architectural Digest. For more examples, take a look at the White Glove section of the May/June issue of Traditional Homeor the April issue of House Beautiful which featured a home in Philadelphia. Which style speaks to you? Ellen had this patchwork pillow made from her retired pediatrician husband’s old ties. When he was practicing, he always liked to wear “kid-friendly” or doctor themed ties. But, since he had retired, they were just hanging unworn in the closet. Our wonderful seamstress made the pillow. It was a fun project, and a huge success with Ellen’s husband. Let us know what you think! From sophisticated black and white checkerboard flooring to more casual black and white ticking stripes, this color scheme has been a lasting one throughout the decades. Design icon Dorothy Draper used black and white in her decorating schemes in the 1930’s, and today, many designers use black and white as their “go to” color scheme. New black and white furniture pieces from a number of manufacturers were spotted at the Fall Furniture Market in Highpoint, North Carolina. Highland House, a high end furniture company is no exception. Nathan Copeland, president of Highland House says that “the color black helps to ground a room, giving it a focal point, while white provides a sense of freshness.” Black and white can stand alone or is amazing with pops of bright color to punch it up. We all seem to have a pair of colors that we use often – in our clothing or in decorating our homes. Sticking with traditional pairs like black and white may be a safe bet, but maybe it is time to move a little bit outside our comfort zone. 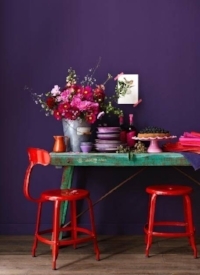 The Crimson and Deep Violet duo we saw on the Domino Magazine website is beautiful, untraditional, and complementary. It could be risky, but, in smaller doses and in the right place, it will be stunning. The magazine suggests “filtering in accent pieces that belong within the spectrum of the two shades.” We also suggest using lots of neutrals to balance the brightness and boldness! Times Square – Black and white checkerboard floor by Emser Tile – This is the tile that designer Tobi Fairley is installing in her foyer as a part of the year-long renovation of her home. She is chronicling her project as the newest columnist of Traditional Home magazine. Toile Fabric is a timeless choice in black and white – This Bouvier comforter set by Thomasville at Home can be found at www.wayfair.com. This is the unusual color scheme that caught our eye on www.domino.com. We loved stopping down at Design Trade back in March as they hosted their annual Fabric Extravaganza. Vendor reps from many companies were on hand to present new products and to show their road line samples. It is definitely a treat to talk to the reps and ask for their expert opinions about the products. Seeing, touching, and feeling the beautiful silks and embroideries along with the more practical wovens and upholstery fabrics is a designer’s delight. 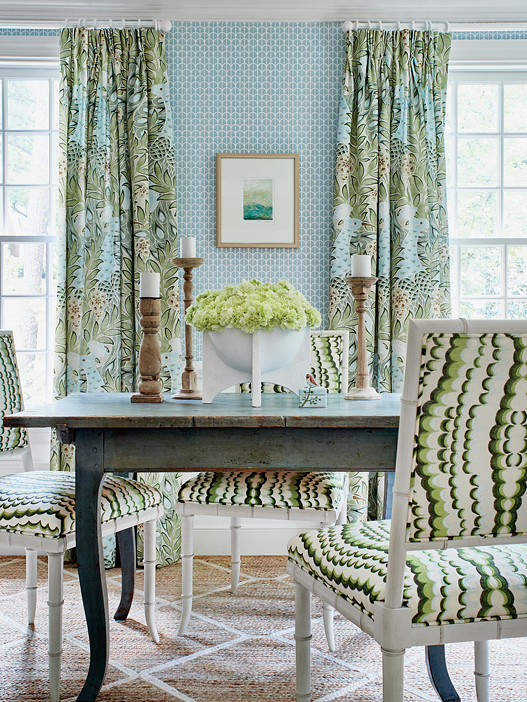 There were so many beautiful new fabrics in all of the latest colorways from many of our favorite manufacturers such as Thibaut, Kravet, Scalamandre, Duralee, and many others. There is truly something for every taste and budget in these new collections.